VIEW is a breakthrough in lyric presentation and video/picture playback applications. With the power to satisfy both the audience and the performer, VIEW makes it simple to create spectacular visual effects with scrolling lyric display. VIEW utilizes the same script based cueing system as the rest of the Stagesoft production suite, making it simple to place Video and Lyric display cues directly into the script, making it possible for the entire crew to know exactly where and when the cues are going to execute, allowing for greater collaboration among the team. Easily show different content on different screens.VIEW guides you through the creation of multiple outputs. Each screen can operate independently, allowing you to create confidence monitor views with more information and notes than the audience sees. Engage your audience with moving backgrounds and video content easily shown on any combination of outputs. Want to use an old LCD monitor in a crying room? No problem. VIEW supports different resolutions on each output screen, backgrounds will scale and text will wrap to display correctly. You can display different lyrics and backgrounds on each screen, with complete script synchronization! This is great for displaying lyrics in multiple languages at the same time, English on the left screen, Spanish in the middle, and French on the right! Applying a semi transparent gradients over an image/video to create an area with more contrast to display your lyrics in. VIEW’s scrolling lyric display makes it easier for the audience and talent to follow along. It is easy to add cues to your script that start and stop lyric display in your script You can decide how many lines of text show up for each screen, select font styles, and text colors to match the mood you are trying to create. It is even possible to have different fonts on each output. Each output can have its own resolution, allowing use of existing equipment. Supports background pictures and video loops with lyric presentation on top. 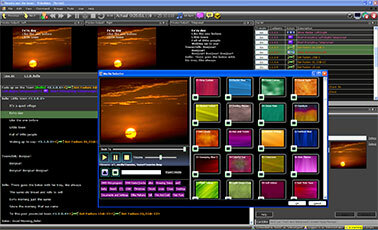 Special effects with transition elements including scale, rotate, and fade. 18 types of cueing commands: Shared Announce, Shared Warning, Blackout, Start Block, CCLI Info, Clear, Display text, Popup Message, Prompt, Clear Background, Image, Slide Show, Stop Slide Show, Transform, Video Background, Stop Video, Reset sync time to zero, Set countdown timer. Synchronization with lighting and audio. Complete control over the text layer parameters of each screen. Smooth scrolling text that follows the script. Display quotes and titles with complete control of font and positioning. popup message on confidence monitor “5 minutes remaining”.